Our project empowers students and instructors in the following ways: (1) Making the everyday work of students; (2) Helping students stay relevant and up-to-date with technology; (3) Supporting alternative format education, such as vocational and remote education; (4) The participatory nature of the design process itself. Dash makes daily learning more engaging by giving students access to interactive course material, such as 3D models, to make theoretical concepts easier to grasp. 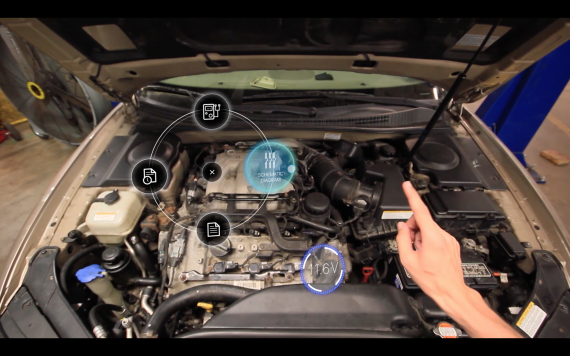 The system also brings together disparate sources of information essential for car repair, such as circuit diagrams, vehicle specifications, scan tool data and course material, in one place via augmented reality safety glasses. This saves students the time and effort of shifting their attention between sources and enables them to be fully immersed in the multi-sensory nature of their work. Students can also customize their digital dashboard to ensure frequently accessed information is always visible. For times when they need to concentrate on physical work, a simple gesture clears away the digital information from their view. The system is designed to help students make sense of the information and solve the problem by removing unnecessary complexity due to fragmented information. By focus on problem-solving, Dash equips students with a valuable skill that will help keep them relevant even in the face of rapid technological change. While we designed Dash for the education context, we also see such a tool supporting students in professional work too. Our reason for focusing on vocational education stems from the renewed interest in alternate format education as universities becomes increasingly expensive. While we focused on the context of a vocational school for this project, Dash also opens up opportunities for distance learning. Students could potentially access course content, instruction and personalized feedback on Dash, while partnerships with local garages in remote areas provide the environment needed for hands-on learning. Here we see Dash empowering students by making quality education more accessible. The final impact we see comes from the design process itself. The participatory nature of this project serves as an immediate means of empowering students. By conducting several in-depth interviews and co-creation workshops with students, we see the impact on students through changes in how they think about the challenges they face and their perceived sense of agency to create new and better ways of working.